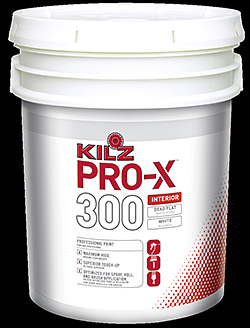 KILZ PRO-X 300 Series interior latex paint is low VOC and low odor, and can help a project qualify for LEED credits. Product 300 is a dead flat sheen available in five classic white colors. Flat, eggshell and semi-gloss products are available in a two-base system that can be tinted to more than 1,000 high-hiding colors.